MS Regina della Pace is car and foot passenger ferry owned by Blue Line International ferry company. Built in Finland in 1979 the ferry is just over 136 meters long and 24 meters wide with speed of 19 knots. It has a capacity of 1550 passengers and 450 cars. The vessel has 420 cabins with 916 beds and reclining seats. There are also two restaurants, 3 cafes, 2 bar, small shop, casino, chapel and TV lounge. 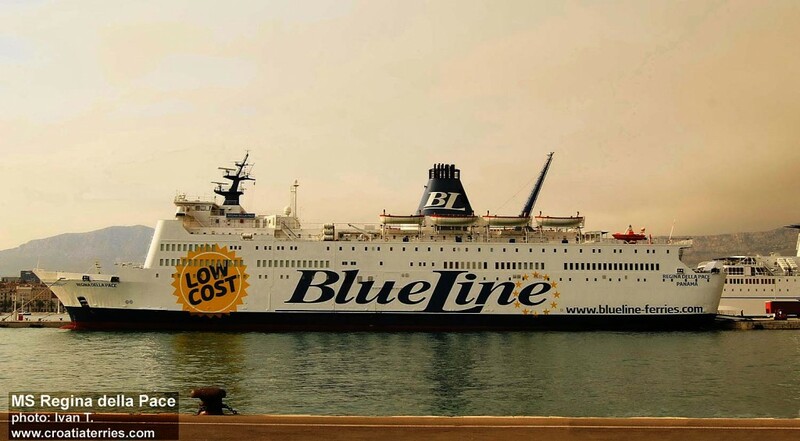 Regina della Pace is currently serving BlueLine‘s ferry route 66 connecting ferry port Ancona with Split and Hvar (Stari Grad). Ferry Regina della Pace in Split port.